Those of you that have seen the trailer for 'Song for Marion', a movie coming to big screens on 22nd February might have noticed a Plaxton Paramount Tiger coach in one of the clips. This is a vehicle owned by Henry Cooper's of Annitsford, Northumberland. During filming the vehicle spent many days being driven around the Newcastle area and is very much part of the storyline. 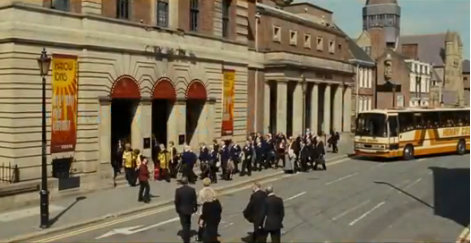 The trailer can be seen here, the coach appears briefly at 1 minute 23 secs. The Tiger has been in the Henry Cooper Fleet for many years. Here it is seen parked in their yard in 2012 awaiting it's next duty.